Last night we pulled out the grill and dusted it off for the first time this season to roast some eggplant for making baba ghanoush. However, the propane tank was empty, so I decided to try grilling the eggplant directly over a gas stove flame instead. It worked like a charm, infusing a deep smokiness into the eggplant, which I enhanced a bit further by adding in some liquid smoke as well as a sprinkle of smoked paprika. This version of baba ghanoush is tahini-heavy and spiked with caramelized garlic oil with rich strands of roasted garlic throughout. It tastes amazing straight out of the food processor, but if you can wait a day or two for the flavors to really mingle, it becomes an even more richly complex yet delicately textured spread. Separate the cloves of garlic, but do not peel them. Place in a small glass pyrex dish and drizzle with the olive oil. Cover with foil and place in the oven to roast until caramelized and tender (anywhere from 30 minutes to 45 minutes). Slice the top off of each of the eggplants and discard. Using an open gas flame, set the flame/heat level to medium and place one of the eggplants directly over that with heat-resistant tongs. Leave it there for 2-3 minutes—then turn to another side to char for 2-3 minutes more. Repeat this until all sides are charred. Place the eggplant on some absorbent towels to slightly drain while you prepare the second eggplant. When both eggplants are done, you can half them and scoop/scrape out the insides with a spoon, then discard the skins. Place the eggplant into a small food processor. By this time, your garlic should be almost ready. Remove from the oven and remove the cloves to cool. Pour the rich and garlicky leftover oil into the food processor with the eggplant. Once the garlic is cooled, add it to the food processor, along with the next four ingredients. Blend until smooth. You can either serve immediately or refrigerate for a day or two before serving. 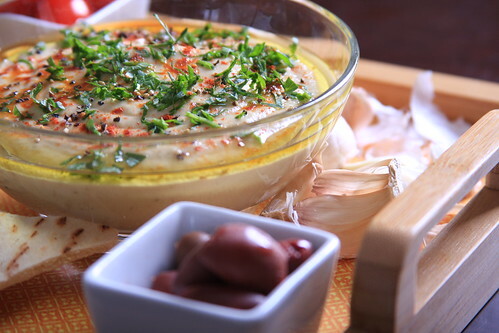 This is definitely the best way to prepare baba ghanoush! It looks really fantastic. oh YUM!! i loooove baba ghanoush! yours looks so delicious! making my mouth water! thanks for sharing! Thanks Stephanie — I would love to try out that restaurant and taste their version! Do you use the inside of the eggplant only? I just made this but I mistakenly used the charred skin as well. Tastes great though! Thank you for your wonderful website! yes, you use the insides only — I updated the instructions to be a bit more clear to discard the kins. Thanks for making it, Ash, and your feedback!